This giveaway concludes January 31, 2019. Winners must have a valid U.S. address for shipping purposes. Get Night Driver for Free! So this was it, he thought. He had his first fare and was now officially a cab driver. He shook his head as he exhaled the smoke into the morning cold. Well, he’d use the taxi time just as he had promised himself. He would figure things out, get a hold on himself, keep some little money coming in, and find the men who had murdered his wife. Nick Cullen’s wife was brutally murdered in a burglary gone horribly wrong, and he’s not the type to move on with his life, especially when he has seen the faces of the murderers in person. His plan: learn how to drive a cab so he can find his wife’s murderers on the streets of Los Angeles. Nick’s nighttime rides lead him down dead end after dead end, until one day he manages to get a hold of the ID of one of the men who destroyed his life. Nick’s chase heats up and he’s forced to face the truth of how far a man will go who has nothing left to lose. 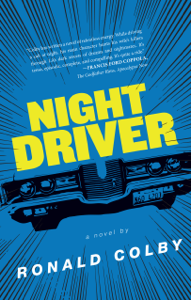 Night Driver takes the reader on a white-knuckled thrill ride through the dimly lit streets of nighttime Los Angeles and into the dark heart of a man pushed to the brink. An unforgettable journey of obsession, sadness, and revenge. Colby has written a novel of relentless energy. While driving a cab at night, his main character hunts his wife’s killers through LA’s dark streets of dreams and nightmares. It’s tense, episodic, complete and compelling. It’s quite a ride.